Doing some spring cleaning? 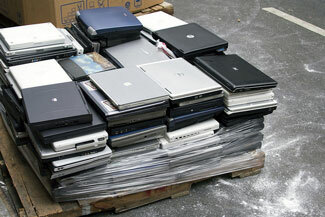 Now is the perfect time to dispose of those old electronic items sitting in your drawers and stashed in closets. But don’t just throw those old electronic items out. According to the Environmental Protection Agency, electronic waste contributes 70 percent of the toxins found in landfills, while only contributing one percent of the volume of materials. Plus, more and more states are starting to make it illegal to dispose of electronic items in the trash. For instance, on April 1, 2011, a New York law goes into effect that requires manufacturers to offer electronics recycling/take-back programs. And in 2015, it will become illegal for New York residents to throw their gear out. Fortunately, there are much better solutions than your curb. 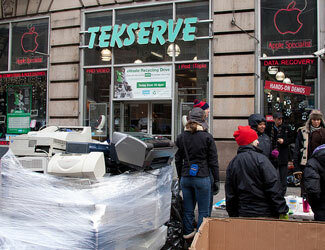 A number of retailers, like Tekserve, that will buy your unwanted stuff, often for more than you may think. And if the gear is truly worthless, they’ll even recycle it for you—safely and properly. Before you turn your gear in, you’ll want to make sure you’ve backed up your information and shredded files with personal data. Be aware that when you delete a file, the file name is removed from the list of available files and the computer knows it can use that space to save new data. The old file data is still there, though, until it is overwritten. And that data can be retrieved with a data recovery program. To remove data from your hard drive permanently, it needs to be wiped clean—preferably overwritten multiple times with a dedicated hard-drive wiping program. For Windows PCs, try Eraser (free on eraser.heidi.ie) or EgisTec Shredder ($9.95 on EgisTec.com, supports Windows 7) and for Macs, try ShredIt X (free on Apple.com). Some retailers, like Tekserve, will back up your files and shred them for you. Even if your computer doesn’t qualify for Tekserve’s trade-in program, they will still transfer your data to a new computer purchased there and then safely recycle your old computer. So it pays to shop around for the best solution. If a local retailer can’t take your electronics items off your hands, check out trade-in sites like BuyMyTronics.com, Gazelle.com and CExchange.com. And if it turns out that your item is worthless, consult EcoSquid to find your best recycling option. Tekserve Recycling Drive: April 16th, 10 a.m. – 4 p.m. Through its longstanding partnership with The Lower East Side Ecology Center, Tekserve will be hosting its quarterly recycling drive in front of the store at 119 W. 23rd St., New York, NY (on Saturday, April 16th, from 10 a.m. to 4 p.m.). Additionally, the drives will continue on Saturdays, May 7th and May 14th and Sunday, May 22nd in separate locations in Manhattan. For a full listing of drop-off locations, check out tekserve.com/recycling.